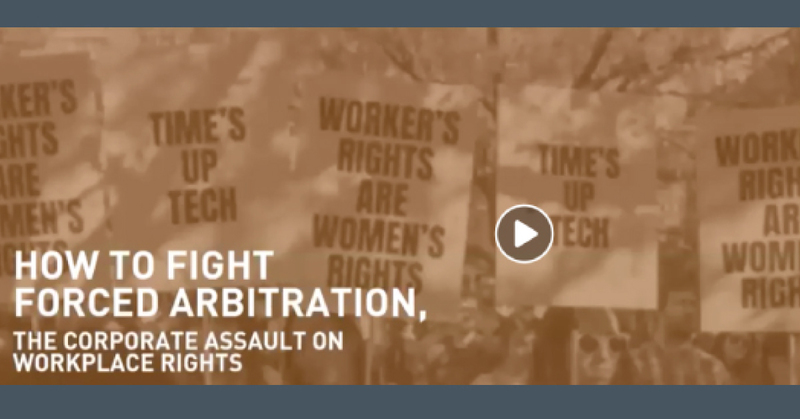 In a webinar on March 5, CPD’s Rachel Deutsch spoke with Tanuja Gupta from End Forced Arbitration, an alliance of Google workers, and Reyna Lopez from the CPD affiliate PCUN in Oregon, about corporate use of forced arbitration to strip workers of their rights – and what we are currently doing to fight back. Watch the webinar here. Corporations now force over half of American workers to sign arbitration clauses that waive their right to go to court if they ever experience injustice in the workplace. Instead, these workers’ only recourse is to arbitrate their claim before a private arbitrator (often hired by the company), usually in secret. It’s so difficult for workers to win in arbitration that an estimated 98% of legal claims are simply abandoned when the only option is arbitration. The large and growing scale of forced arbitration has a chilling effect on workers seeking to vindicate their rights in areas ranging from overtime and minimum wage to discrimination and sexual harassment. But CPD and our allies are fighting back. Tanuja explained how Google employees organized a 20,000-employee walkout in November that eventually drove the company to give up arbitration for employment disputes. An offshoot of that walk-out, the End Forced Arbitration campaign, is now organizing workers across tech to pressure their employers to abandon forced arbitration. The most effective way to address forced arbitration is to change the law. Earlier this year, Congress introduced the Forced Arbitration Injustice Repeal (FAIR) Act (H.R.1423 and S.610) to make forced arbitration clauses unenforceable. And as Reyna explained, state and local governments can pass laws to reinvigorate workplace rights by strengthening public enforcement agencies and giving them new tools to partner with workers and community organizations. By empowering workers to pursue legal penalties on the government’s behalf, states and cities can preserve access to court even for workers restricted by arbitration clauses, similar to a law currently in place in California. Some of the penalty revenue should be allocated for community organizations to educate immigrant workers, low-wage workers, and other vulnerable worker populations about their rights and assist them in pursuing justice. CPD affiliates and their allies are campaigning to expand this model to six other states: New York, Massachusetts, Washington, Oregon, Maine, and Vermont.